Blueplate PR, a boutique public relations agency in Raleigh, announces three new clients in the architecture and residential development industries: Tonic Design, a multi-award-winning architecture firm in Raleigh; pod architecture + design, an award-winning firm that relocated from Los Angeles to Carrboro; and Modus NC Investments, the design and development group behind “The Saint,” the luxury brownstone-style townhomes currently under construction on St. Mary’s Street in Raleigh. Tonic Design is actually a returning client. Through Blueplate PR’s previous media strategy, principals Katherine Hogan, AIA, and Vincent Petrarca were named “Rising Stars” by Residential Architect magazine in 2013 and their projects have been featured in a host of national publications. Hogan also received a 2014 Women in Business Award from Triangle Business Journal (TBJ) in the “Future Star” category. pod architecture + design is owned by partners Doug Piersen, AIA, and environmental/experiential graphics designer Youn Choi. Licensed in five states, pod a+d completed nationally and internationally acclaimed projects in the Los Angeles area and beyond before relocating the hybrid architectural firm first to Durham then, more recently, to Carrboro. Based on the recommendation of another architect, Piersen contacted Blueplate PR to help his firm establish a stronger presence in the Triangle region. Modus NC Investments is a Canadian-based real estate development group that includes architect Souheil Al-Awar. Al-Awar designed The Saint’s 17 modern, four-story townhomes going up on St. Mary’s Street between West Jones and West Lane streets with sizes ranging from 2700 to 4400 square feet. Modus NC Investments insists The Saint will “redefine luxury living” in Raleigh. Blueplate PR is charged with increasing the project’s visibility and differentiating it from other residential developments in the city. March 4, 2010 (RALEIGH, NC) — Marc Hoffman, an acclaimed composer, pianist, vocalist, recording artist, music educator and book author has selected Blueplate PR in Raleigh as his public relations agency of record. Hoffman established himself as a composer of concert, film, theatre, pop, and gospel music early in his career. In the early 1990s he began pursuing his passion for jazz. As a pianist and vocalist, he performs his own repertoire of original jazz as well as his own arrangements of standards, ballads, and pop. He performs solo, with a trio and with his quartet. In the coming months, Marc Hoffman will release his sixth CD entitled “Curioso,” and see his second book published – a children’s book based on an original lullaby, “Sleep, Little Child.” Emerald Books published his first book and companion DVD, “Essential Worship Keyboard,” in 2007. Blueplate PR, a boutique agency located in downtown Raleigh and known for its roster of creative, artistic clients, will provide traditional and social media public relations services and marketing consultation for Hoffman’s various pursuits. For more information on Marc Hoffman, go to www.marchoffman.com. 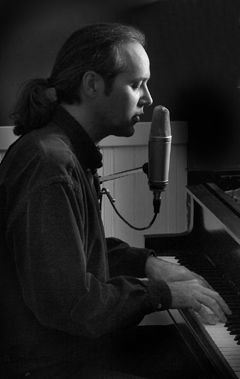 Composer/pianist/vocalist/author Marc Hoffman received his degree in composition from the North Carolina School of the Arts and studied film composition at the University of Southern California. He also attended The Dartington International Summer School of Music in Devon, England. A member of BMI and the American Composer’s Forum, he is also founder and artistic director of the Salisbury School of Music. He lives in Salisbury with his wife, Anne, and their daughter August. For more information Marc Hoffman and his work, visit www.marchoffman.com. He is also available on Facebook. Blueplate PR, owned and operated by award-winning journalist Kim Weiss, is a small and cost-effective boutique public relations agency located in downtown Raleigh, NC, with a free structure optimized for modest PR budgets. This makes Blueplate PR the ideal solution for small firms, companies, businesses and individuals with limited marketing budgets. Intentionally small, blueplate pr provides personal attention to each client. For more information visit http://www.blueplatepr.com.